Fat Friday Bash Info - L.A.C.E. Thank you to everyone who joined us for our Fat Friday Bash!! ​Email us below for tickets! ​Jump into the purple Caddy for a fun ride through Rock, R&B, Blues, Funk, Soul and all points in between. You'll find yourself dancing and singing along as CADILLAC GROOVE puts their unique, high energy touch on the songs you know and love. ​ Join us for fun, fun, fun!! Food served from 8-10 pm! 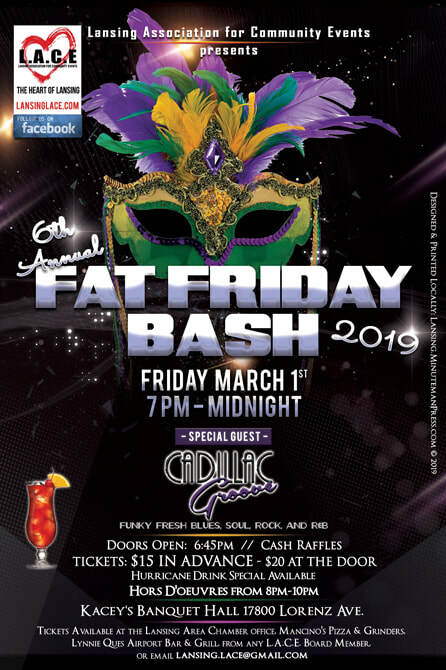 Beads, Music by Cadillac Groove and Raffles!